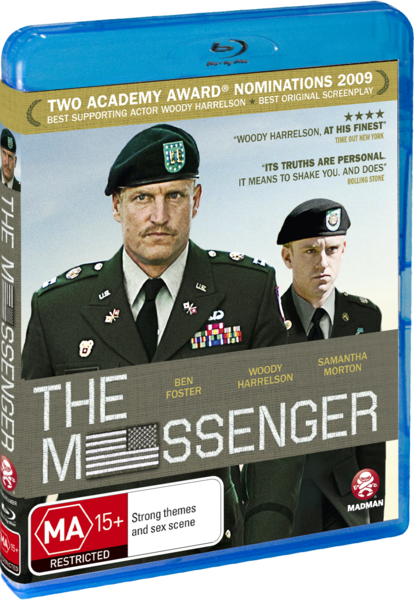 The Messenger tells the story of US Army Staff Sergeant Montgomery (Ben Foster), injured during a tour of duty he is assigned to the Casualty Notification Service along with Officer Stone (Woody Harrelson). 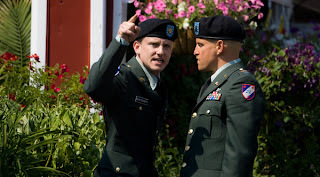 Montgomery is a decorated war hero who is sent to deliver death messages to the next of kin of fallen soldiers, a constant struggle as he is still dealing with his own post war demons. I have been waiting to watch this film for such a long time but unfortunately I missed its limited theatrical release here in Sydney. Thankfully Madman have released this wonderful and dramatic film on both Blu-Ray and DVD. In many ways I feel sorry for first time director Oren Moverman. Every one of his future films will be judged against this incredibly moving and touching film, and rightfully so. I don't really know what the hell tour de force means but I'm quite sure this film is one of them. I've enjoyed the acting abilities of Ben Foster since first watching him in Flash Forward, a kind of sitcom for kids which aired here on the ABC. Since then he has been nothing short of impressive in each and every one of his many and varied roles. I wholeheartedly consider Foster to be one of the next generations screen legends, along with James Franco and Emile Hirsch. This is purely my own personal opinion but an opinion that I have argued over many a schooner of beer. He manages to steal so many scenes from old hand Woody Harrelson. Woody does manage to make an impersonal automaton likeable or at very least pitiable by the last scene. An angry man with a fractured mind who has all but shut himself off from outside interference. Early in the film our protagonists spend much of their time delivering death messages to loved ones, receiving the full brunt of each family members anger and sorrow, gut wrenching and uncomfortable. 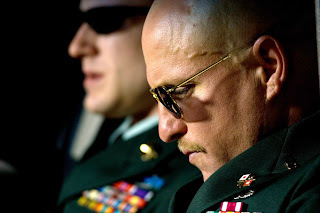 One particular scene had me incredibly impressed, not just with the actors in the shot but also with the cinematographer (Bobby Bukowski) and the director. This scene was about 5 minutes long, covering the full gammut of emotions and all encapsulated in a single unbroken shot. An incredibly bold and brave undertaking which was executed to perfection, itfelt stripped back, allowing the actors and the source material to do their job. The Messenger does a fantastic job in avoiding any political opinion, showing the price of war without denouncing war in general. This is beautiful and incredibly emotive film that gives an insight into the most emotional of jobs which leads two men on a journey of introspection.